U.N.: ISIS Is Using Tens Of Thousands Of Civilians As Human Shields In Mosul : The Two-Way The fighters are allegedly killing civilians who refuse to comply with their instructions or who they suspect are loyal to the Iraqi security forces, the U.N. human rights chief says. 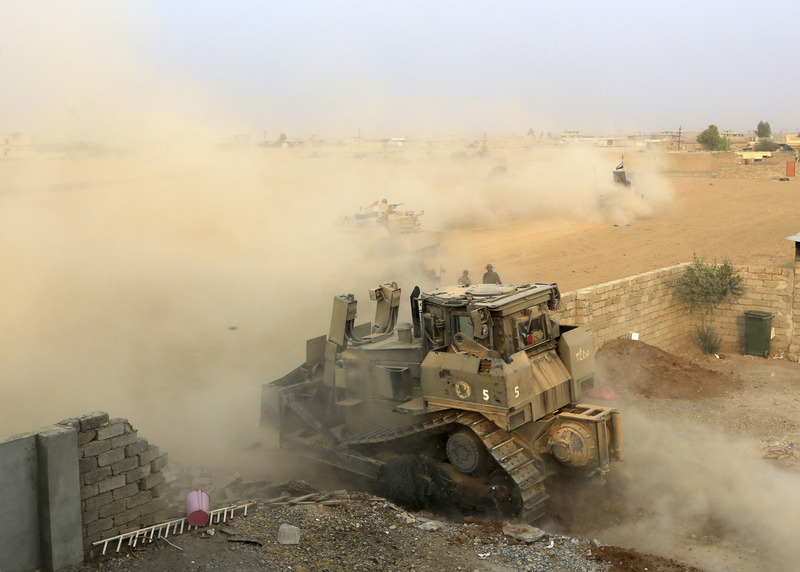 Iraq's elite counterterrorism forces advance toward Islamic State positions Tuesday in the village of Tob Zawa, about 5 miles from Mosul, Iraq. As Iraqi security forces advance toward the ISIS-held city of Mosul, ISIS militants are said to be rounding up civilians from surrounding areas and bringing them to the city to use as human shields. That's according to a new report from the U.N. human rights chief. What's more, it says the militants are allegedly killing civilians "who refuse to comply with ISIL's instructions or who previously belonged to the Iraqi Security Forces, including 232 civilians who were reportedly shot to death last Wednesday." Civilians are reportedly being abducted from surrounding districts and moved to "strategic ISIL locations," according to the report, which uses another acronym for ISIS. "ISIL's depraved, cowardly strategy is to attempt to use the presence of civilians to render certain points, areas or military forces immune from military operations, effectively using tens of thousands of women, men and children as human shields," Zeid Ra'ad Al Hussein, the human rights chief, said in a statement. Reporting from northern Iraq, NPR's Alice Fordham heard from a man inside Mosul that "there are rumors there of ISIS taking people and positioning them around the city. Several people have disappeared from his neighborhood, and he fears they will be used as human shields or forced to be fighters." "The extremists have used similar tactics before," she adds. On Oct. 17, Iraqi forces launched the offensive to retake Mosul, one of the largest cities in Iraq. This is seen as their most difficult fight against ISIS to date — and victory would mean ISIS losing the last major urban center under its control in the country. The U.S.-led coalition against ISIS has advisers on the ground and is providing air support to the Iraqi forces, but is not participating in combat. Since the start of the operation, there has been widespread concern about the potential impact of the fighting on the estimated hundreds of thousands of civilians still in Mosul. The offensive is expected to take months and there are fears that civilians won't be allowed to leave. Even if they can, it's unclear whether they will have a safe route out.